Water dispensers are an inspired solution to getting cold or hot clean water whenever you want conveniently. Today, wa﻿ter dispensers don’t just give you cold and hot water but have additional features like the ability to dispense water at room temperature, a refrigerating unit, and the ability to filter water as well. These new features make water dispensers an essential in every household. ​Here we have outlined the different types of dispensers found on the market, the features you should be looking for in the best water dispenser, and reviews of our favorite picks. Water dispensers come in all shapes and sizes. Here is what you should know about the kinds of water dispensers out there and their features to make an informed decision. There are typically two types of water dispensers; floor units and tabletop units. Floor units are mounted on the floor and stand at least 3 feet high. Tabletop units are small enough in size to fit on any table or desk. While both types of units perform the same function, floor units can dispense a greater volume of water than tabletops. However, table tops take less space than floor units do. While tabletop units don’t have a variety of mounting options, floor units do. With floor units you can mount water containers in two ways: top-mounting and bottom-mounting. In top-mounting structures, the water bottle has to be lifted and tilted on the top of the water dispenser and put in place for the water to flow freely. In bottom-mounting structures, the water bottle is usually connected to the bottom of a water dispenser and put in place by connecting the lip of the bottle to a nozzle on the dispenser. Generally, water dispensers can hold bottles containing 3-5 gallons of water. Smaller units carry less water and bottles have to be replaced more frequently. Bigger units can hold more water and hence bottles don’t have to be replaced as frequently. Units made from steel are more sturdy and durable. They also look sleek, presentable and are easy to wipe clean. However, their heavy weight makes them difficult to move around and they are expensive. Plastic units are more commonly found and are more affordable. They are also easier to move around. However, they aren’t as durable and may be difficult to wipe clean. Also, they sometimes dispense plastic tasting water. Ceramic is another material used to make water dispensers. Here are the advantages of going down that route. The best way to prolong the life of your water dispenser is to keep it clean. Take a look at this method to clean your water dispenser. Here are our picks of the best water dispensers on the market. Though it is made from steel, the structure weighs only 32 lbs. 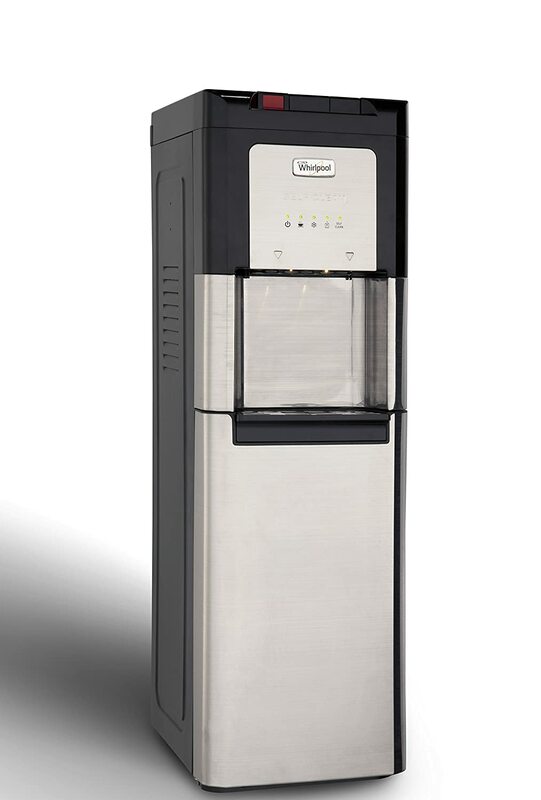 This is a top-loader water dispenser that looks as good as its functions. The steel structure makes sure the water remains pure and hygienic. Its thermostat settings allow you to adjust the temperature of water according to your requirement. This dispenser is perfect for office use but can be used at home as well. This bottom-loader dispenser is perfect for home use, especially since replacing the water bottle is no hassle and can be done by anyone. The dispenser is made for BPA free plastic and is NSF certified. The black exterior is stylish and it's reasonable size makes it a unit that can fit even in a small home. This dispenser is also child-friendly as its size and features make it easier and safer for children to use as well. 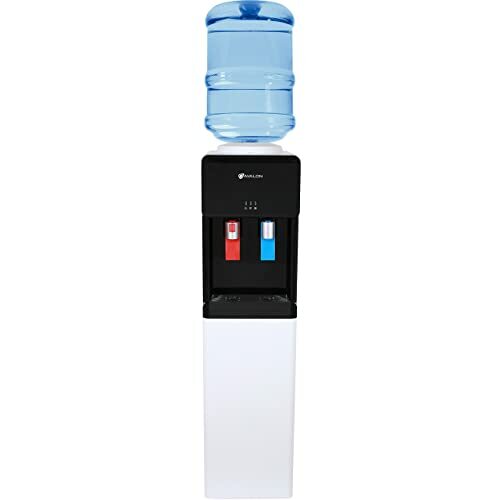 The dispenser weighs 35 lbs and stands at 41"
The Avalon Top Loading water dispenser is made to be used in compact spaces. It is built to be used at home but small offices can house this as well. The plastic body is lightweight and easy to wipe clean. It has both hot and cold water nozzles that dispense water at just the right temperature. If you are looking for a super sleek, high-tech water dispenser, then this amazing model from Whirlpool is the answer to your prayers. This stainless steel bottom loading dispenser has 6th sense technology that uses unstable oxygen to kill bacteria and any other virus that contaminates water making this a self-cleaning dispenser. This deluxe looking dispenser screams luxury. The dispenser weighs 300 lbs. 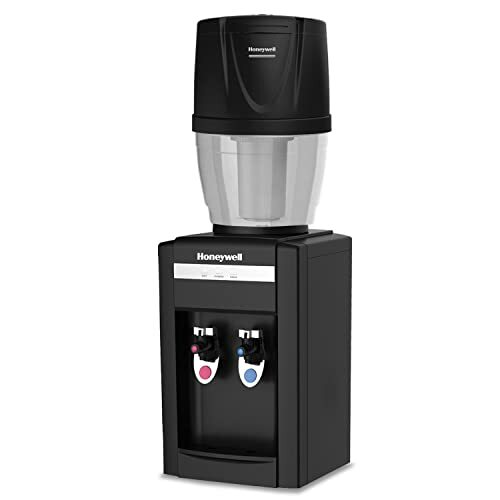 The Honeywell Tabletop water cooler dispenser is a must-have for every small office and home. This half-plastic, half steel dispenser has a removable filter that can be filled with tap water. The dispenser comes with a filtration system which means you can use tap water without any worry. You can get both cold and hot water efficiently. Though it’s on the pricey side, our top pick is the Whirlpool Stainless Steel Water Cooler Dispenser because simply it offers great value for the money. It isn’t just an amazing looking unit but the state of the art technology helps you get cold and hot water without using a lot of power. The intelligent compressor runs in cycles, so you save on electricity. It is sturdy, smart, and self-cleaning and perfect for both home and office use. This water dispenser is truly an investment you won’t regret.